Earlier this week, Buckcherry premiered the new music video for “Gluttony,” the first single from their new album, "Confessions". You can check it out below. The video, which was directed by Billy Jayne, features the band performing the song in a church filled with people indulging in all types of vices, while the video’s protagonist struggles to overcome his own gluttony. “The concept of the video is excess, consuming everything excessively, and moderation is not even in the equation," says Buckcherry vocalist Josh Todd. "I’m very familiar with that, and a lot of guys in the band are familiar with that. Buckcherry is on the road now, headlining North American shows, and will join Kid Rock on the upcoming Rebel Soul Tour beginning February 2 in Kansas City, MO. The first leg of the tour runs through March 2. The band also has been added to the second leg of dates for trek which run from March 18 in Sioux Falls, SD through April 6 in Saginaw, MI. 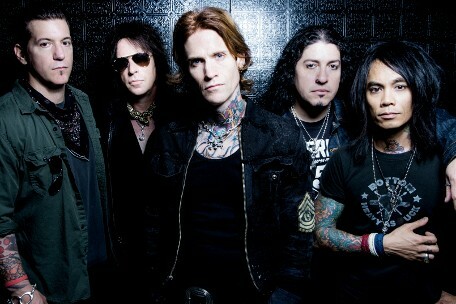 Buckcherry will release "Confessions" February 19 via Century Media Records. “Gluttony” is available for purchase through iTunes now. Did Buckcherry Steal The "Recovery" Riff From Florida's Dirty Skirty?